You can customize the Doteasy Email Protection dashboard display in the Preferences section. Number of entries to display per page controls the number of messages per page in the message summary. Allowable values are 10, 30, 50, 100, 200, 500 or 1000. Hide help text by default By default, the hep text for each page is hidden and there is a “Show Help” link that reveals the help text. This is to minimize the screen area taken up by the help text, and to keep it as unobtrusive as possible. However, if you prefer to see the help by default, set the setting to No. Home page controls the page you see when you log in to your Doteasy Email Protection system. Preferred image format By default, the Doteasy Email Protection system displays images in the PNG format. These images include all graphics you see on the dashboard interface. If your browser has problems display PNG images, you can use the JPEG format instead. Method of choosing quarantine actions controls the display of the options available for accepting or rejecting messages. For example, the Drop-Down List option will display all choices in a drjop-down lists, while the Checkbox option will display the choices in checkbox style. Show recipient column in quarantine display If you select Yes, then an extra “Recipient” column will be shown in the quarantine display. Note that only the first recipient will be shown and the column is non-sortable (ie. you won’t be able to sort the quarantine display by recipient. Show relay column in quarantine display If you select No, then the Relay column is not shown in the quarantine display. Show statistics table on login screen If you set this to Yes, then the Doteasy Email Protection System will display a summary of the contents on the quarantine. By default, this option is turned off because the query to generate the summary can take a considerable amount of time on a large quarantine. Show the “Actions Taken” page If you select Yes, then after you have taken an action (ie. against messages, senders, etc. 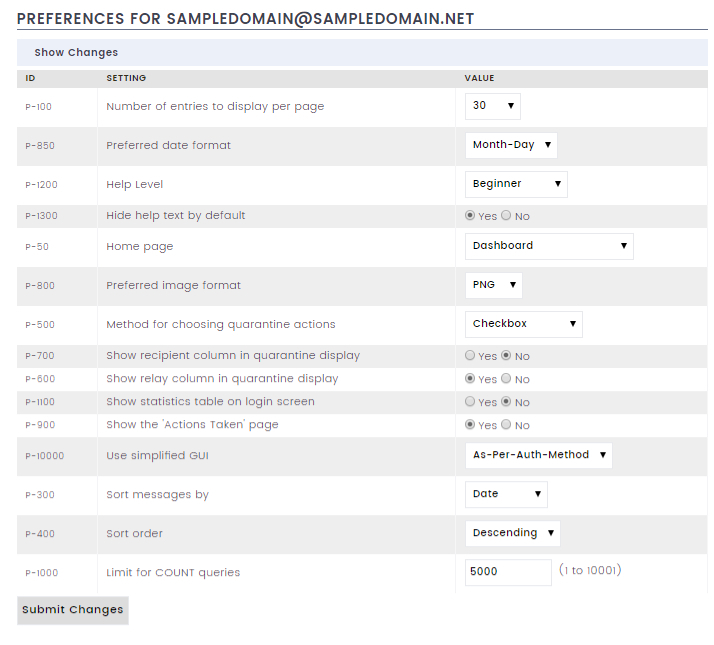 ), a summary page will be displayed to list all the actions you have taken. If you select No, then your Doteasy Email Protection System will skip this summary page and return to the original page immediately after the action is completed. Use simplified GUI By default, this interface style is set to As-Per-Auth-Method. The Doteasy Email Protection System interface has been customized by our system administrators to maximize ease of use while at the same time provide all the necessary settings and options to manage the important parameters to effectively reduce spam in your email inbox. The Simplified Interface option is not supported at this time. Sort messages by lets you sort messages either by date or by spam-scanning score. Sort order controls the sort order (ascending or descending). Limit for COUNT queries On large spam quarantines, it may take a long time for the database queries that count items, such as the number of messages, number of sender rules, etc. If you set this preference to a specific number, then the Doteasy Email Protection System will not count items higher than the specified. For example, if you have 1500 messages in quarantine, but you set the limit to 1000, then the Doteasy Email Protection System will display “More than 1000” for the number of messages.